I’m sure you’ve seen CoinStar machines at your local grocery store and some of you may already use their services, but the hefty fee has always kept me away. I typically pay for all my purchases with my Barclaycard, but for some reason I still seem to accumulate quite a bit of change. 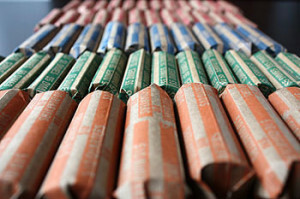 When I was younger, I actually enjoyed rolling up change and cashing it in at the bank. One year, I got an electric change counter for my birthday and went to town! It didn’t work too well but it got the job done for small amounts of change. I’m sure the change counting technology has improved since then, but I can’t justify spending any money on a change counter these days. I just don’t spend enough cash and therefore get enough change to make it worthwhile. I’d like to think that my time is somewhat worthwhile so I definitely don’t want to waste it rolling up quarters and pennies. So that pretty much leaves me with only two options: let my change sit in a jar and lose out to inflation or take it to a CoinStar and pay a hefty 9.8% fee. Until recently, I chose the former. There’s not a whole lot of use for change these days, casinos won’t even take change in their slot machines anymore. I would rather let my money sit there idle than pay some company 10 cents on the dollar to count my money haha. Most of my readers should know by now that I hate fees! In my opinion gift cards are as good as cash these days so there’s really no point in paying a 10% fee to get cash when you can get a gift card for free. So I guess I don’t hate CoinStar machines anymore now that I can cash out without a fee. I’m sure all the companies listed above have some sort of kickback agreement with CoinStar but that’s fine with me as long as there’s no fee for me. I was planning on waiting until I have kids and having them roll up my change for me, so I guess I’ll get to cash in a little earlier than expected. Readers, did you know about this CoinStar trick? Or is there a better/easier/faster method of turning change into cash out there that most people may not know about. Two things: First of all, I did know about the new Coinstar, but the particular one I had used didn’t have a store that I shop at so I couldn’t take advantage of the offer. Fortunately, there is a place near my home which does offer Amazon certificates. Secondly, and more importantly, after I did find that the aforementioned Coinstar didn’t have what I needed, I quickly decided that I, too, couldn’t handly the 10% fee, so the next time, I went to my bank with my rolled up cash. Much to my surprise, the teller didn’t laugh at me or even roll her eyes when I presented her with $10 worth of quarters. She promptly counted them and posted the money in my account. I much prefer this method since I can CHOOSE to buy something from Amazon or not. Thanks Roberto. I think it’s worth it to roll up quarters for yourself but it takes the same amount of time to do each coin and the payout gets worse and worse. I’d like to think that my time is more valuable than rolling up 100 pennies for just a dollar haha. I called both BofA and Chase here is Southern California, and both banks offered an offsite service that would count and deposit the funds into an account held with the bank. After picking up bags at the bank, you just dump in your coins, return the bags of coins to the bank, they ship them out to their counting service, and then in a about 10 days the funds are deposited into your account. If you’re not interested in Gift Cards, nor do you want to roll your own coins, this seems like a nice way to go. Best of all, it’s 100% free…as long as you have a checking/savings account with the bank. Interesting, I’ve never heard of that type of service but thanks for the heads up. I honestly don’t accumulate that much change anymore since I try to pay for everything with credit cards but this is definitely a good option if you want cash. I’m pretty content rolling my change and taking it to my credit union. I put it in my savings account. In the last two years, I’ve deposited more than $300 into savings. It’s something I’m most proud of! Yeah, I love rolling coins. I know, it sounds nerdy. But I usually turn on a movie while I do it. And actually, it takes two rolls to make $1! Last time I rolled change, it took 30 minutes and I rolled $12.50. If I could make $25/hour doing something that easy, I would! Wow I didn’t realize so many people enjoyed rolling coins, maybe I should try it haha. I guess it’s not a bad way to earn a couple extra bucks. Amazon is pretty much the same as cash in my book. It’s nice to turn all that unwanted change into something useful too. Hmm maybe you need to read my article a bit more carefully. I would never recommend using a Coinstar machine to get cash out since like you mention, they charge a fee of nearly 10%. But you can exchange coins for gift cards for your favorite stores for no fee. So would you rather spend 30 minutes rolling up $50 worth of coins(btw what is the cost for the rolls, are those free?) or get $50 to Amazon, I’ll choose the latter. Personally, I relish when my jar is finally full enough to get some rolls. It’s almost as if I’m getting paid $50 for a half hours worth of work which is fantastic in my book, but it’s more along the sentimental lines of childhood memories with my dad. Rolling coins is also a great way to get into coin collecting. I think the cost of a variety pack of 100 are like $1.00 at Wal-Mart or very near that price/quantity. I also love going into my bank with a metal ammo box full of coin rolls when I do cash them in, I get crazy looks lol. I consider my rolls as a secondary liquid emergency fund in a way. $50 to Amazon is great, but an extra $50 in gas if you want to take a day trip to the beach is more to my liking and Amazon can’t buy me gas or a spur of the moment dinner date. Sounds good to me, I used to collect the state quarters when I was younger and now I try to collect coins/bills from every country that I visit. I’d like to throw it all under a glass desk some day. I guess we’re lucky that we have a local credit union that has a coin counting machine you use for free. You pour your money in , it makes a bunch of noise and eventually spits out a receipt, which you can then deposit or cash. I must look hilarious hauling en a small tin bucket full of coins when I go there. We have coin star in Canada and the only thing I found it was good for was cashing out the pennies. Other than that the fee made no sense to us. There are banks however in our area that have the coin rolling machines and you can go in and use them for free. I absolutely despise the penny haha. I actually make a point not to accept them when I get change, I just leave them on the counter as a form of silent protest. Why are we still using pennies? I can’t think of one good reason but I can think of many why we shouldn’t be. Coins are far less of an annoyance here in Canada. The Royal Canadian Mint recently eliminated the penny, which is great because it cost more to mint than it’s face value. The 1/2 penny was eliminated from circulation when it had about as much buying power as the DIME today. Currently retailers round up or down using the “Swedish rounding” system. That said, 99.9% of retailers accept “interac” which is the dominant debt-card system in Canada. PIN access verification at all merchant terminals and NO credit card type risks like the American debit cards which are all run through a credit-card network. That said, there are only a few coin-star machines which few people use. I’ve NEVER seen anybody pouring coins into them. I just roll up mine myself once or twice a year, and it seldom adds up to more than $25 as nearly all my transactions are electronic. That’s true, whenever I travel abroad, coins are pretty handy because you have higher denominations that allow you to actually buy things. Here, all they’re good for is vending machines and parking meters. I like the idea of just getting rid of pennies and rounding up or down to the nearest 5 cents, that would make sense to me. I know more and more people are switching to electronic based forms of payment but I think there will always be a need for cash and coins. Even ALL of the parking metres where I live take cards. They have “pay and display” machines every block or so. You swipe your card, tell it how much time you want, it makes an authorization and prints a ticket. As for the vending machines, new machines are starting to use the “visa paywave” or “mastercard paypass”. Canadian coinage includes $1 and $2 coins, so at least a pocket full of coins here has some buying power. A pocket full of US change however doesn’t amount to much any more. But, I’d still rather use my cash-back VISA for everything. It’s a huge “chunk of change” that I get back every year. Yea coins are pretty much useless here. I too only use credit cards though. The rewards are too good to pass up. True but that probably matters less in today’s low interest rate environment. There aren’t a lot of great short term investments. I’ve got about $300 in amazon credit and another $600 in best buy/amazon credit. Well, the best and easiest way I’ve found is to look for discounts on best buy gift cards. You can buy amazon kindle gc’s at best buy and use them for all your amazon.com purchases. I usually go on slickdeals once a day or so to stay on top of deals like this. A few months ago, BB offered a free $5 gift card with the purchase of a $50 gift card. I bought $600 worth and got $60 free 🙂 Amex has now done 3 separate sync promotions where you get a $20 statement credit when you spend $200 at Best Buy. I have 5 Amex cards so I love deals like this! Another option is that most credit unions have these change machines for free use. BudgetsAreSexy.com gave me that bit of advice. Yea I didn’t know about that until another reader mentioned that actually. Coinstar machines are pretty ubiquitous though for those of us who don’t have a CU membership. Definitely an interesting post! All I remember from my childhood about coin counting machines is that it made a lot of noise, and never seemed reliable. I guess I have to agree with your opinion towards them, and I do like what Amazon is doing and my hope is that they will continue to succeed. Yea I used to have some of those crappy Mr. Robot counting machines that never seemed to work haha. I abhor rolling change and I don’t have a local CU/bank that does it for free near me so Coinstar works great. I love Amazon so an Amazon gc is as good as cash to me. Just browsing your archives and found this article. I can’t believe people don’t just take their loose coins to their bank or CU. My bank actually prefers loose coins instead of rolled ones. Most banks have coin counters that takes about 2 minutes to count all the change. Like Jose and The Warrior said above, it spits out a receipt and the teller either gives you currency or deposits that amount into your account. We do it about twice a year and we usually get a couple hundred $$ each time. A truly painless way to save. The hardest part is getting the coins out of my pink piggy bank! Well I think most people still bank at the big banks(Citi, Chase, etc) and they never have free machines or let you deposit loose change. It sounds like CU is the best way to go, is that the type of bank you use? Actually, it is a FDIC bank but not one of the big ones like Chase etc. Just a “state” bank in our small town. Gotcha, I figured it was either a CU or a small local bank. I just turned in nearly US$300 at a Coinstar machine and like you I cashed out via Amazon. I had been diligently rolling them with intent to *someday* take them to the bank. But my bank informed me that while they might accept a few rolls, bulk coinage needed to be loose for them to count. I figured, if I have to break up my rolls I might as well have some fun with Coinstar. Yes, the bank will give me cash or deposit the money but I do shop at Amazon regularly so it’s all good. Plus, by keeping a close tally with my bags of coins, I could really put the Coinstar machine to the test. My one other use showed it to be 100% accurate. And it was again this time. The known amount involved 5,860 pennies, nickels, and dimes. It rejected a Canadian dime but the count still came out even so either it was off by 1 or I was. I tend to think the latter. But out of nearly 6000 coins, my being off by 1 is, I think a pretty good track record for me. So with the machine — at least this one — being proved flawless, I will have no qualms about dumping in change of unknown amounts and trusting the results in the future. I get quarters all the time when I service the laundry room machines in the bldg. I take care of, and somehow image to collect a decent amount of coins throughout the year. In a pinch, I’d bitten the bullet and cashed in my coins for straight out cash at the coin star machines if I happened to be a bit ahort of dough for a bill or any other emergency. But I prefer Amazon about 9 out of 10 times, with iTunes fur the rest. We’re talking a minimum of 55 and up to 165 dollars on each trip. ( I either take one full small coin bag or take a filled to capacity bigger bag). But here’s another “trick”. Since these machines here in Massachusetts can only be found at a couple of rival supermarket chains, every now and then I simply get a store card. I then use such card to pay for groceries. I believe that is the closest thing to straight no-fee cashing in that one can go on a coin star machine. Also, this is an excellent choice for those that have reservations regarding choosing outlets like Amazon over local brick and mortar retail. Hi, Harry, well I have finally come over to check out your Finance Site, and I have to say, brother, I am very impressed. Just starting to discover what you have hear. You create tons of value. For that I say, thanks brother! Anyways, I wanted to comment, I have utilized the Amazon gift cards, on several occasions, its a good deal. Heck, you are going to buy stuff on Amazon anyways, right? I actually learned this from my teenage son, he was doing this for awhile with the extra change I was giving. Again, thanks for the tips Harry! Look forward to exploring this site. Haha awesome Raul, thanks for checking it out! Hi Maria, thanks for the info! We live in San Diego and there are also several Indian Casinos in the county. They may or may not charge, depending on the casino. I don’t see why they would turn down the chance to win the money. I have used the c******r machines, but only when the banks were closed. I would only cash the small coins i.e. pennies and nickels and save the quarters and dimes to reduce the fee. Well its amazing, got to know many things….